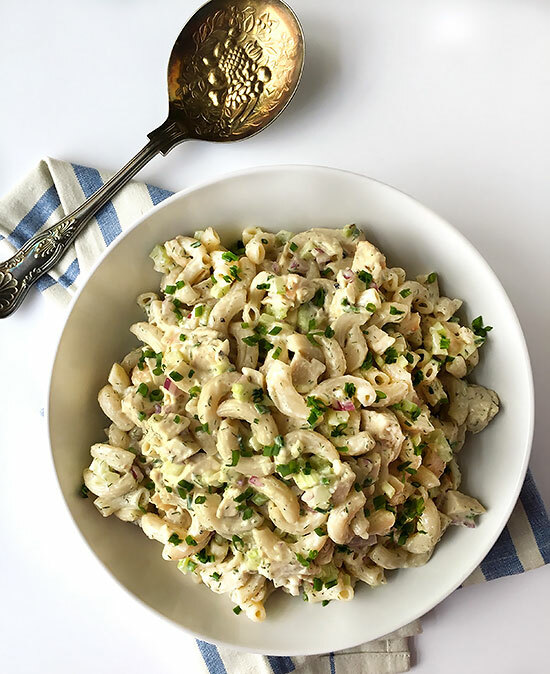 This tasty Chicken Macaroni Salad is one you will want to have on hand during the warmer months of Spring and Summer! Hey guys! Hope you are having a great week so far. We had thunderstorms here in our area this afternoon. Marble-sized hail was hitting our windows so hard that I thought they might crack. The tornado sirens going off in the background were a nice accompaniment to Twister, which just happened to be on TV. Spring is always an interesting time weather-wise here in Texas. One of my favorite dishes for Spring and Summer is pasta salad. It really makes a nice refreshing lunch dish on a hot day, which is just one of the reasons I love it so much. You do have to turn on the stove to cook the pasta, but there’s no standing over a hot stove for an hour. Another great thing about pasta salads is that they are so versatile, you can create a whole variety of different dishes. 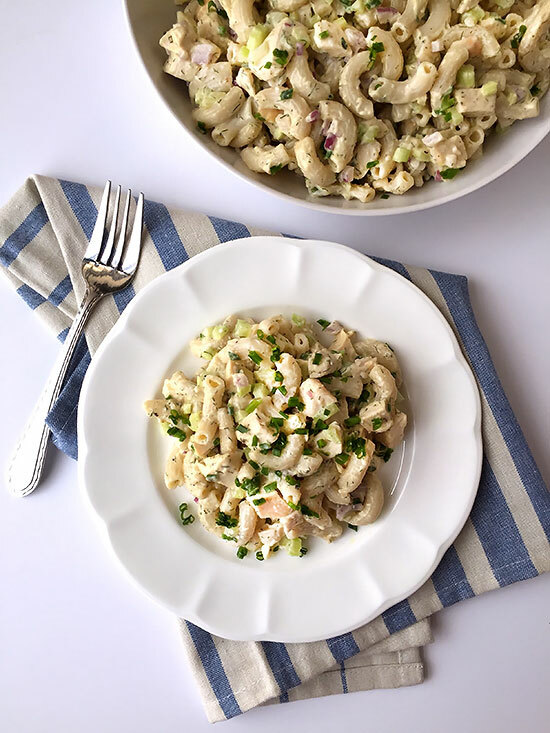 This Chicken Macaroni Salad has quickly become my new favorite. It comes together quickly and is so deliciously flavorful. While I think this is best served the same day, you’ll have leftovers if you’re only serving two people. You may need to add a little warm water to loosen the pasta up before serving the next day. I used a brown rice macaroni, but you can substitute your own preferred pasta. If you don’t have macaroni, you can use any type of tube pasta the same size. 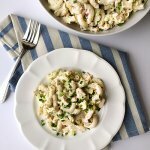 I used the Tinkyada brand of gluten-free pasta, which holds up really well in this pasta salad. In a large pot, bring 4 quarts of water to a boil. Add sea salt and pasta, and let cook, stirring often, until just tender. Drain the pasta, and rinse with cold water until it's cool, then drain shortly. You want the pasta to still be slightly wet. Place it into a large bowl. In a small bowl, mix together the mayo, olive oil, vinegar, dijon mustard, garlic powder, dill weed, and sea salt. Add the dressing, chicken and vegetables to the pasta, gently mix to combine, then serve. If you have leftovers, you may need to add a little warm water to loosen the mixture back up before serving. By Tempie at October 24, 2018 .